Laser vision correction procedures have continuously evolved since the 1990s – offering those with vision impairments the chance to live without glasses. 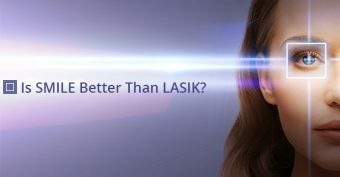 Today, patient’s seeking to correct myopia, hyperopia and astigmatism often choose LASIK or PRK. The latest advancement in laser eye surgery – SMILE (Small Incision Lenticule Extraction) – offers patients with severe short-sightedness or astigmatism, thin corneas or extremely dry eyes who might not qualify for LASIK or PRK to access the benefits of laser eye surgery. SMILE is minimally invasive with little downtime. Dr. Sheldon Herzig discussed the benefits, costs and recovery of SMILE with Elevate Magazine – a publication focused on cosmetic enhancements that improve wellbeing. The Herzig Eye Institute currently performs the SMILE procedure for qualified candidates. The SMILE procedure, unlike LASIK and PRK, does not create a flap in the cornea. Instead, SMILE creates a thin lenticule inside the cornea and removes tissue using the Carl Zeiss VisuMax femtosecond laser – meaning there is little disturbance of the cornea and corneal nerves. Unlike LASIK procedure, which creates a corneal flap, SMILE eliminates the possibility of flap-related complications. Dr. Herzig noted that the SMILE procedure lasts the same amount of time as LASIK or PRK. SMILE patients are able to return to work and drive the day after their procedure. Additionally, depending on the patient, results can range from immediate to just a few weeks. Following the SMILE procedure, Dr. Herzig provides patients with anti-inflammatory drops to provide relief to the eye muscles, antibiotic drops and artificial tears for lubrication. This article offers those interested in laser vision correction and the SMILE procedure with in-depth insights by Dr. Herzig – whose 25 year laser-corrective surgery experience provides patients with an excellent success rate. Approximately half of Canadians will require visual aid during their lifetime – if you want to live without reading glasses and enjoy the benefits of SMILE, contact the Herzig Eye Institute today.